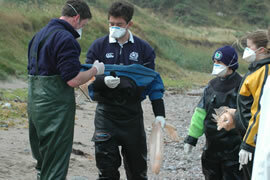 CRRU veterinary team taking samples from a deceased minke whale. 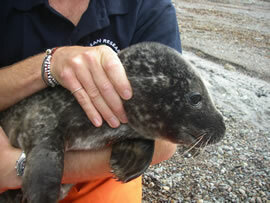 Seals and other marine wildlife also form a considerable component of the CRRU rescue effort. A successful refloat of an Atlantic white-sided dolphin. 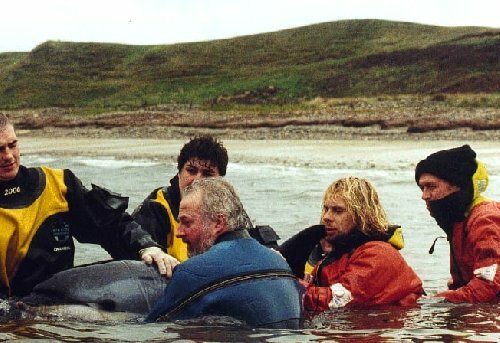 Affiliated with the UK Marine Animal Rescue Coalition (MARC) and providing professional training in marine mammal rescue procedures for national and international agencies and volunteers, the CRRU operates the only full-time, specialist emergency response team of marine researchers dedicated to whales, dolphins and porpoises in Scotland and the UK. The fully trained team of cetologists, veterinarians and volunteers are on standby 24 hours a day, throughout the year, with specialised rescue equipment, medical diagnostics and veterinary supplies to assist sick, injured and live-stranded cetaceans in trouble. The veterinary team also provides international support and advice for stranding situations regarding first aid, veterinary treatment protocols and refloatation procedures as required. In addition to whales and dolphins, the UK team also responds locally with first aid and veterinary support for other marine wildlife casualties, including seals, seabirds, basking sharks and turtles. Between 1999 and 2018, the team has responded to emergency call-outs to no less than 51 live, 16 injured or trapped and 211 deceased cetaceans, over 500 seal casualties and in the region of 350 seabirds and other marine wildlife in trouble. If you find a live-stranded or by-caught whale or dolphin, the CRRU veterinary team should be contacted as soon as possible on +44 (0)1261 851 696. Deceased animals can also be reported to the team for referral, as we work closely with the Scottish Rural Agricultural College Strandings Investigation Unit in Inverness. For further information on what to do if you find a stranded whale or dolphin, click HERE. Species identification (to family at least, i.e. dolphin or porpoise, toothed or baleen whale) can also provide extremely important information for the responding rescue team, and further information on how to identify a live or dead cetacean on the shore can be found using our comprehensive Species Identification Key.